Following on from its successful Volez, Voguez, Voyagez (Sail, Fly, Travel) exhibitions in Tokyo and Paris and the launch of a new America’s Cup menswear collection, high-end fashion house Louis Vuitton is highlighting its heritage in luxury travel with a new exhibition at its Bond Street maison. The Art of the Journey 1885-2016 tells the story of the brand’s foundation as the jet set elite’s favourite creator of monogrammed steamer trunks to the global luxury powerhouse it is today. On display will be some of the finest travel pieces from Louis Vuitton’s huge archive, tracing a timeline of over 200 years which showcases just how far the brand’s modern travel essentials are influenced by their beautiful but obsolete predecessors. Divided into five themes – Heritage & Tradition, Pour Elle, The Library, The Gentleman’s Club and British Summer – the exhibition attempts to evoke the Grand Tour and a golden age of travel when case requirements far surpassed cabin bag allowances. 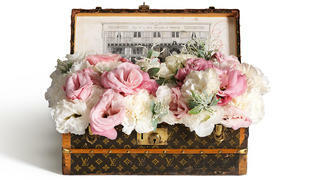 Of particular note are the curiosities and special commissions that tested Vuitton’s artistry and craftsmanship far beyond the average case or luggage tag. Among the best are a trunk bed designed in 1905 for explorer Pierre Savorgnan de Brazza which folds neatly into a small blue suitcase, a travel case containing a foldout desk which belonged to composer Leopold Stokowski and a contemporary foldable lounge chair designed by Marcel Wanders. 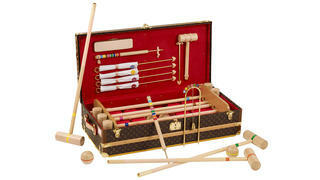 Meanwhile novelties, including a portable casino complete with roulette wheel, croquet kits and a 1927 picnic trunk belonging to the Earl of Lonsdale, represent what is undoubtedly the epitome of luxury leisure. Today Louis Vuitton’s offering is far greater than its namesake founder ever could have imagined when setting up his small Parisian leather goods business but it is clear the brand treasures these roots. If you’re planning on commissioning one of the best luxury suitcases from Vuitton this Med season, this is inspiration in abundance. The Art of the Journey, 1885-2016 exhibition takes place at the Louis Vuitton store on New Bond Street, London from May 29 – June 19 2016. Visit uk.louisvuitton.com.